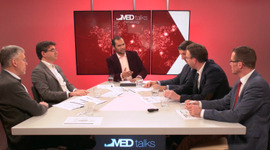 MEDtalks is an independent multidisciplinary Internet TV channel for medical professionals. Interviews with scientists, research results and accredited refresher courses will be published on this website for registered doctors and nurses. Treating patients with chronic lymphocytic leukemia in an optimal fashion seems to become more complex every day. After all, our knowledge of the underlying biological complexity keeps on growing, creating new subgroups of patiets, and on top of that new potential drug combinations are constantly being developed and presented. In this program, a very international discussion panel will guide you through 2 highly relevant publications, helping you better understan the latest developments in the field of CLL. 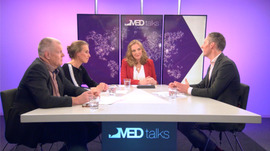 Guests Prof. Arnon Kater, MD, PhD Hematologist, Amsterdam UMC (AMC), The Netherlands Prof. Stephan Stilgenbauer, MD Hematologist, Saarland University, Homburg & Ulm University, Ulm, Germany Gert Jan Timmers, MD, PhD Hematologist, Amstelland Ziekenhuis, Amstelveen, The Netherlands Prof. Paolo Ghia, MD, PhD Internist, Università Vita-Salute San Raffaele, Milan, Italy Kostas Stamatopoulos, MD, PhD CERTH, Thessaloniki, Greece Publications to be discussed Fixed Duration of Venetoclax-Rituximab in Relapsed/Refractory Chronic Lymphocytic Leukemia Eradicates Minimal Residual Disease and Prolongs Survival: Post-Treatment Follow-Up of the MURANO Phase III Study - Kater et al., JCO, december 2018 Cytogenetic Complexity in Chronic Lymphocytic Leukemia: Definitions, Assiciations and Clinical Impact - Baliakas et al, Blood, January 2019 About our "Quarterly Focus" format Publications in peer-reviewed journals are a major source for keeping up with the latest developments in your field. However, you may not always have sufficient time to study (difficult) publications thoroughly and to determine the impact on your clinical practice. To support you, MEDtalks Hematology has developed a new program format: the Quarterly Focus. This innovative program brings an expert panel and authors of relevant, selected publications together to explain and discuss the new data. Prof. Lorenz Trümper about the ECHELON-2 trial. This Euretina Highlight brings you news about: * developments after the presentation of the PLACE trial results . * How will eye diseases being diagnosed in the future? * The importance of OCT in CSC. * Neovaslularization and PCV in CSC. Vassiliki Papadimitrakopoulou, MD, oncologist at the MD Anderson Cancer Centre in Texas, provides information on EGFR mutations associated with resistance to osimertinib in patients with NSCLC and a T790M mutation. These results are from an analysis of the AURA3 study. 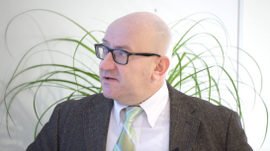 How can we make CAR T cell therapy more effective and safer? Adoptive cellular immunotherapy with chimeric antigen receptor engineered T (CAR-T) cells is currently achieving impressive clinical results in patients with hematologic malignancies. CARs are prototypic synthetic receptors wherein the extracellular input is a cell surface antigen and the intracellular output a composite T cell activating signal providing functional and metabolic cues to determine T cell fate. CAR therapy relies on engineering of T lymphocytes in order to redirect them to kill tumor cells and is the first paradigm of successful clinical use of cellular engineering with synthetic receptors. When targeting CD19, a cell surface molecule found in most leukemias and lymphomas, CAR T cells have produced remarkable clinical results, validating the synthetic biology approach to cancer immunotherapy and consecutively the potential for application to other hematological malignancies and solid tumors. To attain broader relevance, T cell engineering and CAR therapy in particular must achieve effective tumor targeting and tumor elimination with minimal or tolerable toxicity. While therapeutic efficacy of CAR-T cell therapy has been remarkable, a critical mechanism of disease escape includes lack of uniform expression of the target antigen within the clonal tumor populations or downregulation of antigen expression to evade effector cell mediated killing. CD19 CAR-T cell therapy often fails owing to CD19-negative relapse and first clinical trials of BCMA-CAR-T cells have already reported relapses of BCMA negative/low clonal variants. In addition, persistence of CAR-T cells has been inconsistent with some studies demonstrating a correlation between early extinguishing of the CAR-T cell population and the development of resistance. As such, strategies to broaden CAR-T cell mediated targeting of the tumor population and enhance their activation, expansion and durability is critical to develop this potential paradigm changing therapy. The broader applicability of CAR therapy is also impeded by safety concerns regarding the on-target/off-tumor effect of CAR T cells on normal tissues due to the lack of unique tumor-specific surface targets. Although the B-cell aplasia caused by CD19-CAR T cells is an easily manageable clinical situation, this is likely not the case for the majority of potential CAR targets. In addition, the experience of CD19-CAR T cell clinical trials brought into attention the cytokine release syndrome (CRS), mediated by large numbers of tumor-targeted activated T cells, as another safety issue of CAR therapy. Several strategies have already been proposed to regulate CAR T cell function. These include the use of suicide gene strategies, such as the inducible caspase-9 (iCasp9) enzyme, to terminate T cell activity, bispecific small molecules that transiently bridge antigen and CAR T cells, οr dimerizing agents that transiently link the antigen-binding and signaling domains of a CAR. The above studies allow remote temporal control of CAR T cell activity, but they do not address spatial control of antigen engagement and tumor selectivity. To the latter end, affinity tuning or engaging two antigens rather than one provide an interesting paradigm for achieving greater tumor selectivity.